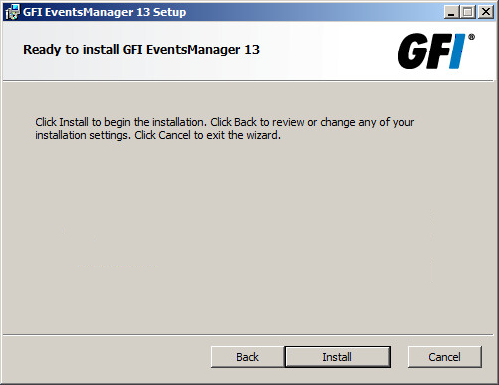 Right-click the GFI EventsManager installer and choose Properties. From the General tab, click Unblock and then Apply. This step is required to prevent the operating system from blocking certain actions by the installer. The installer displays a list of system components that must be installed prior to installing the product. Click Install to start the installation of missing system components (if necessary). The DLib Database Server install wizards opens automatically after system components are installed. Click Next at the wizard welcome screen. Read the license agreement. 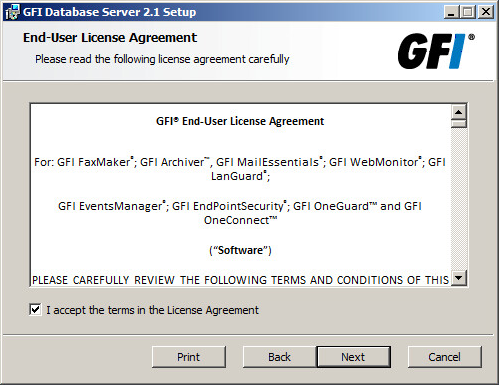 Select I accept the terms in the License Agreement and click Next. Click Next to install the database server in the default folder or click Change... to select an alternate folder where it is installed. Click Install to start installing DLib Database Server. Click Finish when prompted. 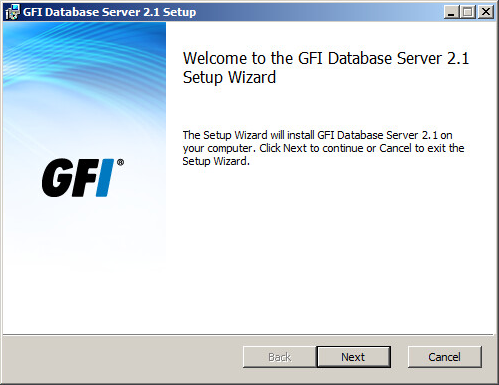 After the database server is installed, the installer automatically opens the install wizard of GFI EventsManager Management Console. Click Next at the wizard welcome screen. Carefully read the license agreement. Select I accept the terms in the License Agreement and click Next. Key in your user name and license key in the User Name and License Key fields. To register for a free 30 day evaluation license key, click Register. Click Next. 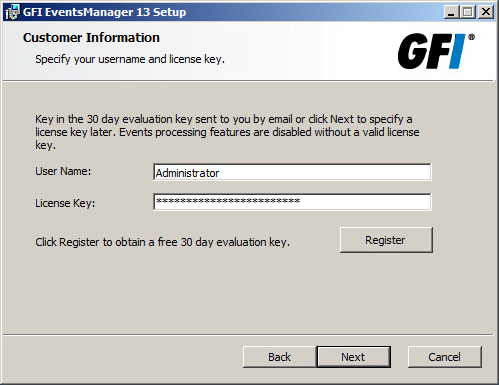 Key in the logon credentials that GFI EventsManager uses to log onto remote computers. It is recommended to use a domain administrator or an account with administrative rights over all the remote computers managed by GFI EventsManager. 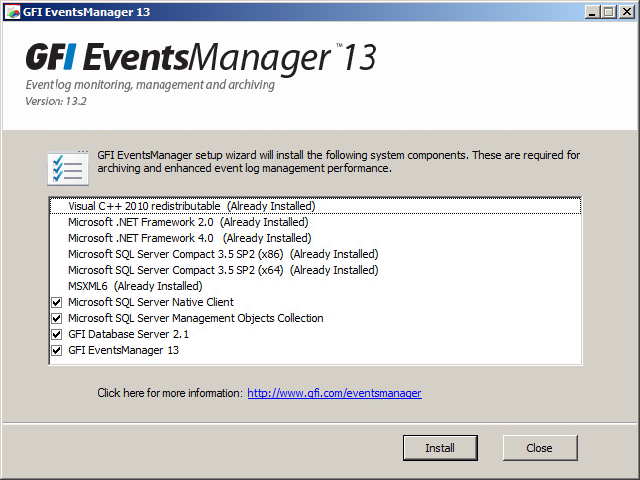 Click Next to install the Management Console in the default folder or click Change... to select an alternate folder where it is installed. 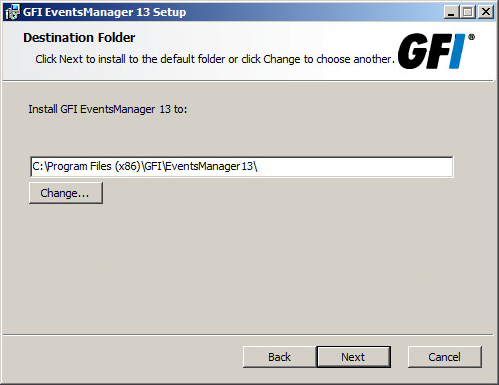 If GFI EventsManager detects an Internet connection, it automatically attempts to download product updates from GFI updates servers. Click Details to expand the information section of the Auto Update dialog and view the updates that are being downloaded. After product updates are applied, the Switch Database Server dialog opens. 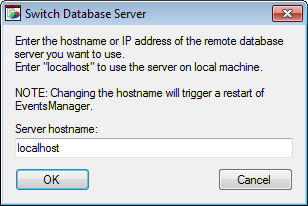 This dialog is used to link the management console to a database server. You can switch database servers from the Management Console. For more information refer to Switching between file storage databases. The localhost - key in localhost (default). Once the installation is complete, the Management Console opens automatically. To launch it manually, click Start > All Programs > GFI EventsManager > Management Console.